There's a possible factor linked to gestational diabetes—and it has nothing to do with how healthy your lifestyle is during pregnancy. Gestational diabetes can be a serious health risk for you and your baby—which is why doctors work so hard to recommend keeping your weight gain within the healthy range, noshing on healthy foods and exercising often during pregnancy. 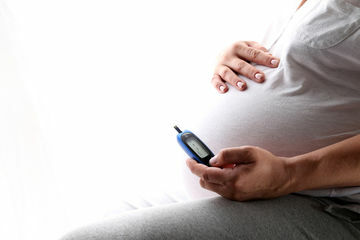 But according to a new study, a factor beyond your control could be to blame for a higher risk for gestational diabetes. Research published in the American Journal of Epidemiology suggests a link between the age of your first period and your gestational diabetes risk—according to these findings, women who menstruated before age 11 may have a 50 percent greater chance of developing diabetes during pregnancy. This research comes from scientists at University of Queensland School of Public Health in Australia. The team looked at data from 4,700 women to come to this finding, and researchers accounted for other risk factors (like BMI, reproductive issues and education level). So should you worry if you got your first period when you were young? Don't fret: This research was based on observation, and there's no known cause-and-effect relationship as of right now. While they observed a link, researchers understand that they need to look at this topic in greater detail to confirm the association. It's also important to keep in mind that when it comes to gestational diabetes, lifestyle factors are incredibly important. Your doctor can suggest ways for you to decrease your odds if you appear to be at risk for the condition. "A large proportion of women who develop diabetes during pregnancy are overweight or obese, and encouraging those with an early start of puberty to control their weight before pregnancy may help to lower their risk of gestational diabetes," researcher Danielle Schoenaker said in a release for the study. "While a healthy weight is important, it is also plausible that the higher risk is explained by hormonal changes, and the research calls for more studies to investigate the mechanisms behind this."